Made of non- porous, high-density polyethylene material, this yellow, color-coded cutting board is a versatile addition to any kitchen. This board will not stain or absorb juice, bacteria, or odor, and this helps you practice proper food handling. The nonskid surface hides knife marks and is non-dulling for ultimate performance. Whether you're running a restaurant, cafe, or deli, this cutting board allows you to handle all your cutting needs in a safe and sanitary manner. This cutting board brought looks so bright in my kitchen. I have been used to wood or white cutting board. I am glad i found this one. Durable and easy to clean. Shipping was extremely fast and it cam in well package. I strongly recommend it. This cutting board is very sturdy with good weight to it. So far it holds up to cutting quite well and cleans up nicely and having the different colors is helpful to prevent cross contamination. The color is great for color coding your kitchen. It is a nice and bright yellow, its a great product and i love having it in my kitchen. Very durable cutting board have each color keep the health inspector happy they have very easy to clean Great size I am very happy with this purchase. This large cutting board is a great value. The 1/2 inch thickness is easily going to withstand years of use. I enjoy using these plastic boards because I know they will get sanitized easier than other wood boards. Product works good and I love that it is color coded yellow for prepping our chickens and turkeys. This is the best price for a cutting board I could find. "ideally used for poultry" but we use these in the front of the house for fruits and vegetables because it goes well with our color scheme. Nice, big, solid cutting board that holds up quite well. Great basic kitchen staple. Is great for prep kitchens that can change their boards according to what they're prepping to help avoid the threat of cross contamination . I bought a whole set of cutting boards, red green yellow and white that we use on a daily basis in our catering kitchen. If cared for, these cutting boards can last over a year. I only had to replace mine once in the last two years. These are great cutting boards and they are nice and big. The best quality. Super fast and affordable shipping. No place out there has these priced lower than Webstaurant. Very satisfied with our purchase. Excellent product. The 18" x 24" x 1/2" Yellow Cutting Board is excellent. It is very durable and easy to clean. This is great for cutting fruits and vegetables but it can also be used for color coding. The price is excellent. I would recommend this. Poultry Board. Perfect thickness, great size, comes in different colors to avoid cross contamination. Wish they were packed for shipping a little better, contacted customer service in regards of this. We are really happy with this cutting board , very heavy and easy to clean , the price is unbeatable and the quality is amazing . This cutting board is just about as good as it gets. They stand up to the usual kitchen abuse, clean up easily, and don't warp like some cheaper boards. An excellent buy for the price! Great item! We have several of these in different colors throughout our kitchens. They hold up well for everyday use and can be ran through dish or washed by hand. This cutting board does exactly what you'd expect. It is a nice, bright color, so it is easy to keep up with food safety rules. It lays flat and cleans up well. These are great, love the bright, easy to identify colors, the size, and the ease of cleaning. They are heavy enough that they don't slip around. These are a must to avoid cross contamination. Health inspectors love them! Yellow means poultry! I highly recommend that you invest in these. They last a long time also! This is a great cutting board. I would recommend purchasing this. It does warp a bit after repeat washing. The yellow color is nice as it stands out and doesnt show many stains. These cutting boards are pretty easy on your knives, so they'll stay sharp. They're big enough to be all-purpose, and they wash well without warping. Thank you for offering this item at a huge cost savings from our "regular" food service provider. Same quality and we can use and abuse repeatedly! Immediate shipment, as always. Thanks! These cutting boards are wonderful and it is so great that they not only come in different sizes but so many different colors as well in order to prevent cross contamination. Great yellow cutting board. Color is bright and easily identifiable as we use this product for raw meat only. Great durability with almost no visible pitting after heavy usage. These cutting boards are great! I love that they have all of the different colors. It has really cut back on any potential cross contamination! Sizable bright cutting board. This cutting board comes in many colors which is great in order to know which one is used for vegetable and meats in order to avoid cross contamination. Very nice rags reasonably prices for everyday small business. They absorb really well and get the job done every time. We color code to help prevent contamination. Had a customer that needed red 18 x 24" cutting boards in a hurry and at a great price. They arrived quickly and have done the job perfectly. Good board for the price. The size is perfect for slicing chicken breasts. With the wear we've seen in less than a month, I'd expect to get maybe a year or half year of use out of these boards before having to replace them. It's just not a complete set without the yellow. This large and durable cutting board is a great surface for slicing cooked meat like chicken. This is a high quality cutting board and perfect for cutting and cleaning raw chicken. It is a nice size with plenty of room for cleaning the raw chicken. I absolutely love these cutting boards! I love the colors! I recommend this product even for using in front of customers. Great sleek clean look! 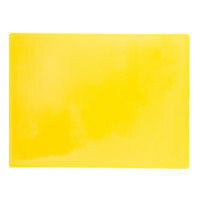 This bright yellow cutting board is easily identified as the one designated for use with poultry only. No matter how busy we are, there is never a doubt about which cutting boards to use for a particular job. In the modern kitchen having color coded boards is essential. Preventing cross contamination is should be high on everyone's list of priorities. These boards are the perfect size and weight. I love this cutting board for the fact that it is yellow. We use yellow items in our kitchen to recognize peanut free (allergy) items. I also have a yellow handled mercer knife to go with it. I like having these color coordinated cutting boards. You can use a certain color for a certain kind of meat or however you want to do it. Great to prevent cross contamination.